The youth wing of the Gorkha Janmukti Morcha today said it would neither participate in the upcoming municipality election nor campaign for the party’s candidates in an apparent bid to pressurise the leadership to take up the statehood demand. The Darjeeling town committee Gorkha Janmukti Yuwa Morcha briefed reporters of its decision to boycott the civic body election that is expected to take place in May. “We have come to a conclusion that we will not participate in the municipality election. We will also not campaign for the candidates chosen by our party leadership. Our focus is completely on achieving a separate state,” asserted Tilak Chhetri, the town committee president. The state government has agreed to the tentative schedule of the West Bengal State Government Election Commission to hold election to the hill municipalities on May 14. 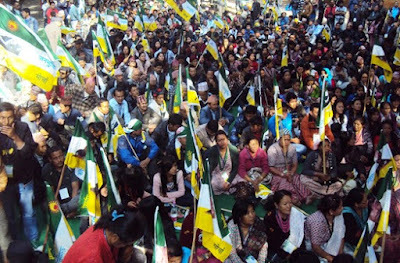 The GJM youth committee came to the conclusion after consulting members from the 32 wards under Darjeeling municipality. “Our committee comprises 61 members from the 32 wards. And we unanimously came to the decision to not participate in the election,” Chhetri said. A couple of days ago, Prakash Gurung, the GJM’s central youth committee president, submitted his resignation as a member of the Gorkhaland Territorial Administration to take up the statehood demand. In his resignation letter, Gurung said the state government had failed to allow the GTA to function properly. Gurung was elected as the GTA Sabhasad from the Rimbick-Lodhoma constituency. The GJM town youth committee welcomed his resignation saying the time was right with the BJP winning in UP. “It is the right time to take up our statehood demand as the BJP has won in UP. The BJP is our political ally and they will do something positive for us,” Chhetri said. The youth committee’s decision comes at a time when the GJM leadership is facing stiff opposition from the TMC hill unit which has managed to make significant inroads, albeit with help from state government doles.